A White Dress- not quite an item to make most people's "Must-Have" list, but I've found this one endlessly versatile. You've seen it on Never Fully Dressed before (here, here and here), and I've only had it since December! 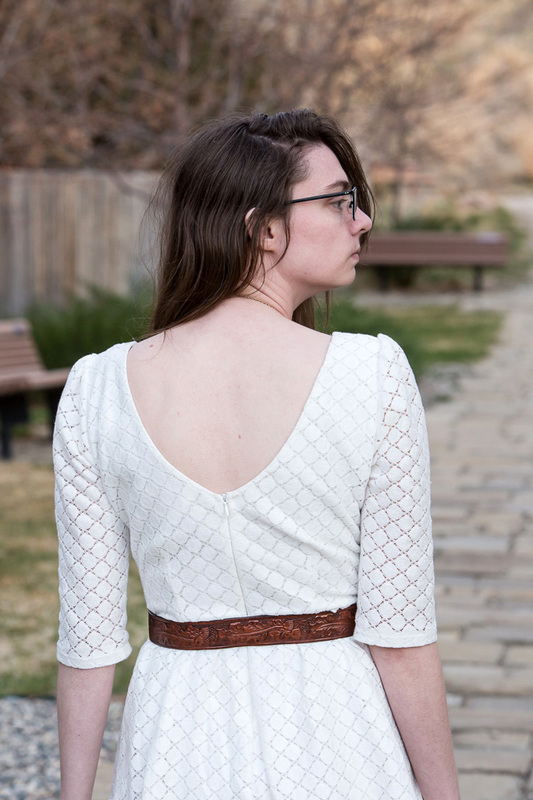 With the springtime finally peeking through gray skies and warmer weather on the way, I was finally able to shed the layers, and really show off the structure and understated quality of this dress. This is how I wore it to my Bridal Shower a week or so ago (pictures of the day coming soon. Thank you so much to my sister Danyon for hosting it!). The slight brown accents of the outfit seem a little woodsy to me, which is perfect for where the pictures were taken- a park the Boy, the dogs, and I had just "discovered." It has winding trails, local fauna and even two slides sloping down the hillside! Funny, I've been coming to Cody all my life, but it is wonderful to discover hidden trails and treasures like this. Since blogging and scouting photo shoot locations, our number of discoveries has definitely gone up too. Are there any new places you have discovered in your area recently? Do tell; maybe we'll all find something a little new! Can't wait to see them in use more as the summer comes, Nikki! I'll be excited to see you in Tieka! I've been terribly lazy with outdoor blog pics as of late. I do prefer outdoor shots though so I need to follow your advice and get outside and discover some great locations, ideally with a photographer in tow since I'm not keen on doing that alone. I shy away from white but it looks great on you with your hair colour and complexion. Also I love how you've paired it with a neutral brown. It warms up the white. I think a white dress has to be on everyone's must have list for summer! I have been collecting (read: hoarding) vintage white dresses for months haha! This is one of my favorite pieces of yours. Happy Friday! I can wait to see the ones you've been collecting! Love the white dress, the belt and owl necklace look great with it. I love your dress the your coordinating shoes and belt. So pretty! This white dress is so pretty on you! It's a precursor to the amazing white dress you'll be wearing soon :). That's great that you found a new photo location. I live in such a "city like" area that it's really hard to find cute locations like these. This dress is so lovely, I've been on the look out for a perfect little white dress for years but just can't decide on one! Oh, you look so pretty! that dress is just so perfect!